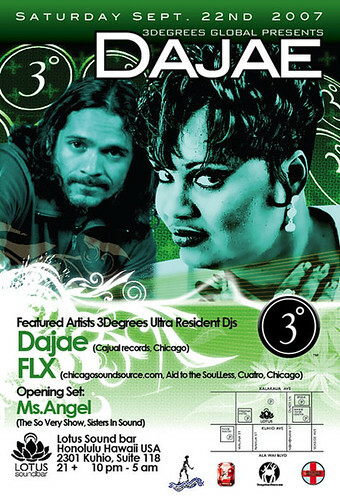 This Saturday, September 22nd at Lotus Soundbar will be the second installment of 3Degrees in Hawaii. The first was the fabulous show in May with FLX, Monna, and Julius the Mad Thinker on the decks and Kenny Bobien on the microphone. This time, it’s FLX, Haboh, and Ms.Angel on the decks and legendary house vocalist Dajae on the microphone. Known for major club anthems like “Brighter Days”, and a more recent favorite on The So Very Show, “Say You Will” (with Cajmere), Dajae knows how to use her powerful voice to get the dancefloor moving. You won’t want to miss this opportunity to see her in person, and dance the night away the way it should be done – with house music. In case you missed it, here’s Kenny Bobien at the last 3Degrees party at Lotus. I know you can feel that vibe! 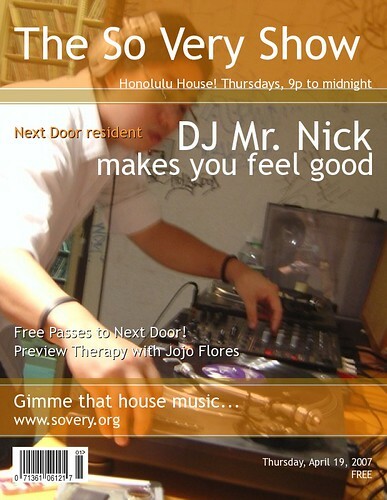 Our guest dj on The So Very Show this week is Next Door Honolulu’s newest resident, DJ Mr. Nick. Mr. Nick has been holding it down in the upstairs lounge on some of Next Door’s most popular nights, and he’ll be there on Friday with his eclectic blend of “feel good” music. What’s that you ask? Well, we’ll drill him on that, and maybe some of his other adventures. Stay tuned for some silky smooth house! Coming up this Friday is a visit to Honolulu from our favorite Montreal native, Jojo Flores as he brings his internationally reknown party, Therapy to Next Door. Jojo visited us on the show in September of last year and the very next night, he played an amazing set at Next Door. We also had the privilege of seeing him once again at the Therapy/gotsoul party at in South Beach, Miami at the Winter Music Conference last month. The 3Degrees resident played along side of Osunlade (Yoruba Records) and Danny Krivit. The excellent music and colorful vibe of the crowd that night made it one of our favorites of the conference, and we’ve been looking forward to seeing him again ever since. In honor of Jojo’s return, we’ll be playing a bit of his Therapy mix cd. The folks at Next Door have also asked us to give away some passes to see Jojo tomorrow night. Tune in to win! Oh, and don’t forget, you can get your Pau Hana on tomorrow at URBAN PACIFIC! There’s a fashion show from 5:00 pm – 10:00 pm with a bunch of local designers. blink of an i productions will be flying in, once again, directly from Los Angeles to photograph the frolics of the night for BPM Magazine. Say hey! Paolo, Jun Jo, and a BBQ! We’ve got a very special guest dj this week. Lotus Soundbar in Waikiki and the Aya boys are bringing out Paolo Mojo (UK – Balance 009/Pryda) to spin at Lotus on Friday night. And lucky us, we get to interview him on the show this week! Paolo’s been touring all over Europe supporting his Balance release. He tore it up at the Living Room on Halloween, 2005. His return to Hawaii looks to be very exciting! We can’t wait to hear what he plays! And finally, this weekend is your last full weekend to go shopping before Christmas! Sisters in Sound have come to the rescue with a BazaarBQ at thirtyninehotel! This Sunday, 12.17.06 2p-8p, Sisters in Sound djs will be spinning and the grill will be fired up! Local vendors will be selling handmade and gently used clothing, jewelry, greeting cards, accessories, art work, and more! Last minute, one-of-a-kind gifts R Us! DJing will be past So Very mixers Toki, Chia, and DJ King and introducing Kittylee! Ms.Angel will also be spinning and Haboh will be presenting original artwork alongside other island artists. Come out and have a drink with us! You are currently browsing the The So Very Show weblog archives for the Events category.